Right-o, back to business it is and here’s the countdown from 14 to 6. I feel like I’m presenting Top of the Pops or something. This scene has probably done more to glamourise violence than any other film to date. But then that’s Quentin Tarantino for you. Michael Madsen is razor-toting, smooth-moving Mr. Blonde, who manages to pull off derangement and torturous side by side with suave nonchalance. The song and the scene are both classics and go hand in hand with one another; never can I hear this song without thinking of this twisted, gruesome experience. I love the way the camera pans round as ear guy writhes and struggles in his chair, all the while Mr. Blonde savouring the moments as he dances to that memorable bass line. I would like to apologise for the horrific quality of the clip, but hopefully the sheer brilliance of the song negates this blunder on my part. Let me make this clear: I LOVE this song. Many-a times has this got me through tedious essays, it can quite easily be played 10 times in a row and remain electrifyingly good. Even better, this scene features the wonderful Joseph Gordon Levitt doing drunken karaoke and he has a surprisingly good voice. Casually caressing the microphone, beer in one hand and giving it all the oomph and charisma that this song deserves, as opposed to shamefully bouncing around your bedroom with only the walls for an audience, Levitt elevates himself to the status of excellence immediately. Especially when singing the “outside the family stew” line. My knees are weak. This is one of those scenes you don’t even have to have seen the film to know. A classic by any standards, I imagine that anyone who has seen it has either fantasised about or actually recreated this scene. (Or is that just me?) The pouring of the Whiskey,(ok so I didn’t go that far), the meal for one alone at the dinner table because you are that grown up and then that oh so famous riff and…The. Coolest. Entrance. Ever. It’s a crime not to air-guitar during this song. Just those first few beats give me tingles of joy. Embodies the grandeur, passion and romanticism that is associated with our idealistic perception of what it is to be French. It’s one of those all encompassing songs, at least for me, in that whenever you hear it you have to stop whatever you’re doing and just be completely taken by the lyrics and melody, even if you can’t understand them. The potency of the song is by no means lost in this scene, especially with the magnetic performance of Marion Cotillard. The film is intercut with flashbacks and her implied death, but the sentiment remains. This is Edith Piaf’s legacy, the song that will forever be associated with her, even in spite of glasses adverts. And oh what a legacy. Parfait. It is a pipe dream of mine to one day learn how to skateboard and on that day, I will make a phonecall, only to look at the clock and realise that “damn, I’m late for school”. Cue ‘The Power of Love’ blasting from the background and a sweet ride hanging onto the back of a jeep. Somewhat nostalgic for me, as I remember having a Michael J. 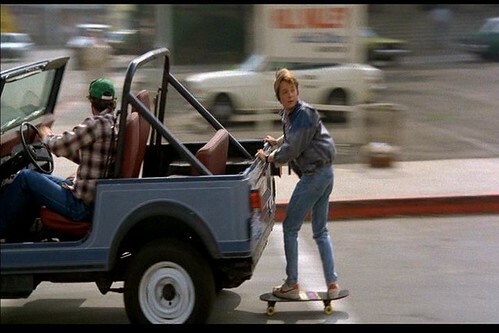 Fox weekend with my dad when I was 11, thinking this was the best film ever and proceeding to skateboard up and down my cul-de-sac in the hope that one day I would be as cool as Marty McFly. The skateboard may be in the garage, but the dream lives on.